Whether you're buying or building a Blue Bird House, you'll find the information you you need right here. 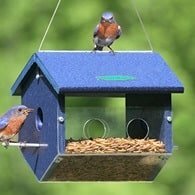 Information including hole size, floor and height dimensions and best materials to use or look for in a bluebird house. 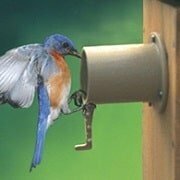 Bluebirds are cavity nesting birds and will readily make use of man-made nest boxes, provided they are constructed properly. 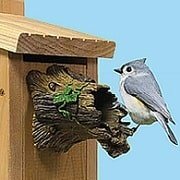 Most birds prefer a natural looking nesting box. Whether you plan on buying or building, make sure that the wood that is used in constucting the house is a naturally decay resistant wood such as cedar, redwood, or exterior plywood. Avoid purchasing any nesting box that is painted and do not use treated wood which contains copper arsenate that can harm Bluebirds. Bluebirds prefer a house that has and entry hole of 1 1/2 inches for eastern and western species and 1 9/16 inches wherever mountain bluebirds may be. 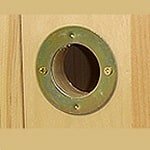 The floor should be between 4 1/2 to 5 1/2 inches square and the floor should be 5 to 8 inches below the entry hole. Do not add or buy any birdhouse with a perch. The birds don't need it, whereas house sparrows, starlings and other Bluebird preadators will have easy access if perches are used. No Time To Build Your Own Bluebird House. Check This One Out! The roof should be slightly slanted to shed water and keep the contents of the nest dry. Each side should provide for ventilation. Drill 1/4 inch holes on the sides of the house just under the roof. Also make sure there is adaquate drainage in the bottom of the nesting box by drilling 1/4 inch holes in each corner of the bottom of the blue bird house. The side or front should swing open for monitoring and easy cleaning. Of course, Duncraft makes it easy for you to follow these guidelines by providing their our own quality Eco Friendly Blue bird House built to last a lifetime. Whether you chose to buy or build one, we encourage you to begin attracting these birds to your backyard. Bluebirds can use our help and you'll get a lot of enjoyment from them.